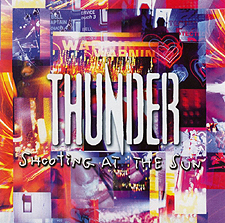 One of the most popular and enduring British rock bands of the last 25 years, with 18 Top 40 singles in the UK and a string of gold and platinum albums around the world, Thunder have just released their landmark tenth studio album, Wonder Days. 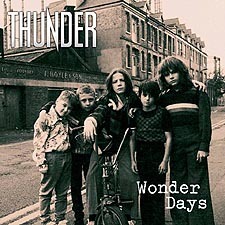 The group’s first studio album in six years, Wonder Days reminds us why Thunder are now more revered than ever before. With a lineage dating back to the cream of hard rock, such as Led Zeppelin, Bad Company, The Who and Deep Purple and songwriting greats such as The Kinks, The Beatles and The Faces, the band’s sound is a timeless marriage of unforgettable melodies and sheer rock power. Their long-awaited return with Wonder Days should ensure that Thunder - Danny Bowes (lead vocals), Luke Morley (lead guitar), Gary 'Harry' James (drums), Ben Matthews (keyboards),and Chris Childs (bass) - are elevated to their rightful place in the pantheon of truly great British bands. Recorded at the legendary Rockfield Studios in Monmouth, with Luke Morley reprising his role as producer, the album was mixed by the renowned Mike Fraser, whose CV includes such names as Aerosmith, AC/DC and Metallica and who worked on several of the group’s key early records including their celebrated debut, Back Street Symphony. 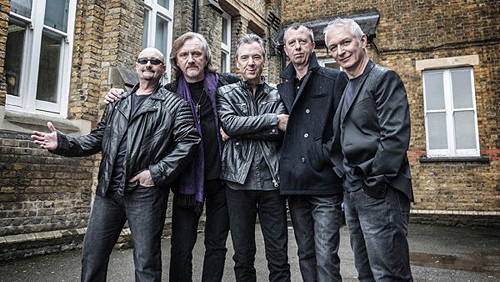 I was recently lucky enough to sit down and chat with lead singer Danny Bowes, and taking things from the top, and knowing that before there was Thunder there was the equally high octane rock of Terraplane, we first chatted about the younger Danny's days in that band. So, as yourself, Luke Morley and Gary "Harry" James all left Terraplane to form Thunder, let's start at the beginning. 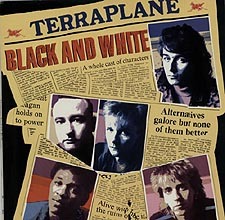 Terraplane's two albums were brilliant, simply fantastic, especially for a young boy like me growing up in Watford, and needing to hear a harder rock sound than a lot of the music that was fast becoming radio pop fluff. So, what was Terraplane's agenda and although it disbanded in 1988, did it succeed in the goals you set out for it? "Terraplane was obviously the precursor to Thunder and although the message in the music was diluted by record company interference, the lessons we learned during our time in that band served us well when we formed Thunder. Basically, we made just about every mistake a young band could make during the four years we were signed to Epic. Mistakes we vowed not to repeat." So, being that your debut with Epic Records, Black and White, was heavily delayed, causing you to completely re-record a huge chunk of it, in reflection was that a good thing or a bad thing for the debut album? "This comes under the heading of “inexperienced band make mistakes aplenty”. It was a long time ago so my memory is faded but in retrospect and with hindsight I think we used our heads much more than our hearts when it came to a lot of the decisions." You were also forced to rename it, as it was originally called Talking To God On The Great White Telephone, but who enforced that title change - and why? "The record company and the manager thought the title was in poor taste. They thought we may alienate some sections of the media so insisted on the change. Another example of a young band making mistakes." Moving target, the follow up album, was a more "soulful" release and with less rock it obviously didn't go down too well with all the fans. With Epic Records exerting pressure on you, was it your choice, as a band, to break up and try again under a new banner, perhaps? "The Moving Target album moved away from straight ahead rock as a result of the record companies influence and its desire to make the band more palatable to mainstream UK radio. We went along with the changes in the belief that we were doing the right thing and the record company were right in their conviction." "When we finished the album we realized we made a mistake. By then it was too late and the relationship between the band, the manager, and the record label started to disintegrate as a result. The inevitable parting of ways followed soon after the album’s release and the band broke up. It was several months later, after Luke and I took a trip to America, that we decided to form Thunder. It was to be a new band on our terms with no outside influence." And, as there are many answers to these two questions out there on the internet, I'd like to get this straight from the horses mouth, so to speak: Why was Terraplane named as such, and subsequently also, Thunder, of course? "Terraplane was named after a Hudson Terraplane car. Our then-manager told us his father had one. With Thunder, it was a case of settling on a name that described the music. Luke suggested Thunder because it was big, loud and simple, which we felt summed us up." Thunder's debut album, Backstreet Symphony (1990) is still, to this day, one of my all time Top 3 rock albums to listen to! Produced by Andy Taylor from Duran Duran, and now on EMI Records, did it feel like you had finally been allowed to write, create and bring forth the album YOU (as a band) had always wanted to? "Yes, absolutely. Our deal with EMI was done on the basis that we would do exactly that." It's follow up, Laughing On Judgement Day (1992) reached #2 on the UK Albums Chart and all four (4) of its singles were Top 40 hits. Just when everyone was saying how hard it was to follow up a successful debut album with another of equal or higher values, you did just that! In reflection, could anything have gone any better for you? "Kylie Minogue owes us one! Her Greatest Hits album was released in the same week and though we were beating her all week, she had a great Saturday and went to number 1. Of course, we’re not at all bitter about it...!" 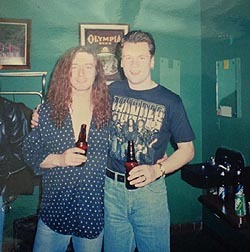 For the record, around that time it was said that Whitesnake's leader David Coverdale was trying to poach Luke Morely from Thunder, although you "confessed" later in 2002 that the whole thing had been made up by the band to engineer some press interest! If that's true though, why did Thunder need excess press interest when they were so successful in the UK Album and Singles Charts and were touring like crazy too?! "You can never have enough press." The last time we spoke, indeed, the last time we met face-to-face, was in Windsor, Canada (just the other side of Detroit, MI) where I came to see you play @ 1991. As you now have the photo of that very same moment in your hands, as we speak I am wondering what three (3) things instantly come to your mind when you look at it today, nearly some 25 years later?! "Shirt. Hair. OMG." 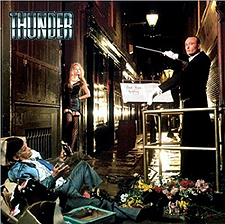 Thunder's third, and final album for EMI Records was Behind Closed Doors in 1995. Another success, reaching #5 on the UK Albums Chart, and containing three more Top 30 hit singles, it was like the band could do no wrong! Being that you guys were making pots of money around that time, and before, what was the most lavish item you purchased ... and what about the other guys also?! "We never made pots of money and we’re not lavish in our spending, though I think Harry did buy a new knitting machine around that time." That album was backed by The Thrill of It All in 1997 which reached #14 on the UK Albums Chart, and the hit single from it ('Don't Wait Up') reached #27 on the UK Singles Chart. The fifth album was Giving the Game Away in 1999, released to conicide with the bands 10th anniversary, it actually ended up serving as your farewell piece. The band subsequently broke up. So, as things were notably not as easily obtainable any more re: higher album/single chart positions, TV performances, and such, you yourselves must have noticed the sea change. So was the break up simply down to a change of sound that was being gently ushered in as you got closer to the 00's, or were there things going on behind the Thunder scenes that we, as fans / media were not privy to? "By the time Giving The Game Away was released, it was almost impossible for the band to get press and promo opportunities as no one was interested in the band. We were effectively ploughing a very lonely furrow. We felt that rather than go round in ever decreasing circles, it would be better to step away and do other things." After just three (3) years disbanded, Thunder reformed in 2002 for a slot on the Monsters of Rock arena dates! So, what was said to you to bring you out of retirement so easily, so fast, I have to wonder? "I conceived the idea for the Monsters of Rock arena tour and agreed to do it with the promoter. My role was to be behind the scenes but the promoter decided he wanted Thunder on the bill and made it a deal breaker. The other guys in Thunder wanted to do the tour and though I didn’t, it was a case of do the tour or my event wouldn’t get off the ground. We knew we couldn’t do one tour and disappear and the Internet had enabled bands to self-release so we decided to make a record and take control of our destiny." The next year the new album came out, Shooting at the Sun, this time released on your own label, STC Recordings. Closely followed by The Magnificent Seventh in 2005, then Robert Johnson's Tombstone in 2006, and then Bang! in 2008, it's like you were writing constantly during your three year hiatus, never stopped thereafter, and suddenly Thunder were "popular" again! But what do you yourself put the resurgence of Thunder popularity down to in the 00's, because my guess is you simply toured your asses off and got live in people's faces! "Thunder has always been a band that loves playing live. During that time when we didn’t have a major label marketing team behind us, the best way to get in front of people was to go to them and play a show." And like all good things must, Thunder came to (another) end in 2009! Your final gig as a band, at that stage, was at the Sonisphere Festival, Knebworth, UK that year. So what can you recall about that day, and how you told the en masse of fans there supporting you? "We announced the break up in January 2009. Running the label, managing the band, and basically being all things Thunder for the past 6 years had taken its toll on me and I needed to step away for the sake of my sanity. We decided to play a goodbye tour which started in April and finished at Sonisphere. I recall that show was very good and more of a celebration in feel than anything else. That said, it had been raining all day so everyone was soaking wet." 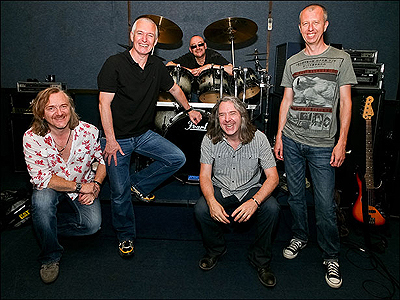 After a few years and some dates around England, especially a rather high profile one touring with Whitesnake and Journey in 2013, Thunder finally announced they were back reunited, once again, and that the new album was forthcoming. Titled Wonder Days, it was released in early 2015 and has since proven to be yet another huge success for the band. So, what is it about this band that keeps you coming back for more? "We started playing the Christmas shows again in 2011 and gradually played more and more shows. When Thunder toured with Journey and Whitesnake in 2013 we noticed how many people were there at every show to see the band and wearing Thunder t-shirts." "Reaction on that tour was great with so many people singing the words every night. It felt like a good time to get back together. We agonised long and hard over the writing and recording and we wanted to be sure that we were all prepared to commit to a new album and all that entailed." How has the line up changed for this new album, Wonder Days? Any new personnel we should be aware of that have laid down some riffs, twiddled some knobs, so to speak? "Obviously, Ben wasn’t around for most of the recordings as he was recovering from his illness. Luckily he is back and feeling much better now. We got Mike Fraser (Aerosmith, Bryan Adams, AC/DC, and us back in 1989) to mix it and he did a great job." And why the title, Wonder Days? Where does that originate for you? "The title of the album comes from the song of the same name. It’s written about growing up in London in the 70's, being 15 and feeling awkward, wanting to be older and cool, but being hopeless with girls. Then getting into a band, and suddenly becoming attractive to them, even though the band was terrible!" I can only imagine that the front cover art is of you guys as kids, correct? Given the band personnel changes over the years, was that photograph really taken like that or has it been "reworked" in any way, perhaps? And where was it actually taken and when? "The kids in the picture are actually child models and actors. We wanted to create an image that conveyed a strong sense of what it was like to be a kid in the 70s. We didn’t know each other then so the boys are there to represent the younger versions of us. The photo was taken on a cold November morning in Hackney." Wonder Days debuted on the UK Albums Chart at #9, which gave you your first Top Ten album since 1995! My goodness, that must have made you feel like you could reach up and touch the moon! "It was a great feeling and very pleasing to see all the hard work pay off and to know for sure that there were still plenty of Thunder fans out there." 'The Rain' - "Luke was teaching himself mandolin at the time and read an article about Irish immigrants that went to America to find work. They ended up in terrible poverty and hardship in the great depression and drought. Somehow the two things connected and the song came out of that." 'Black Water' - "This is a song about a thoroughly cold hearted and reprehensible character. It’s not based on anyone we know," he laughs. 'Broken' - "It’s all there in the lyrics on this one. Simple tale: love found, love lost then misery and questions." Will Thunder ever tour the States any time soon, as we are located here in Detroit, MI and we would kill to have you guys play here! "We’d love to play in the US again and will do everything we can to make it happen. We just need a promoter to make us an offer and we will be there!" Er, well, hmmmm ... based on your break up rate, I assume Thunder will disband again in 2019! I'm sorry to hear this news, but wanted to be the first journalist to ask, why did the band break up again in 2019?! "You presume too much, our break ups have never been planned or scheduled," he wryly smiles. Finally, and yes, we ask everyone this question, we here at exclusive Magazine LOVE penguins. So we were wondering if you did also, perhaps? "We have no interest at all in penguins. Sorry about that!"